It doesn’t matter if you don’t know what you need when it comes to your new antenna, but if you’ve just built or moved into a new property which doesn’t currently have an antenna system or you know you have TV reception problems – pixelating, dropping out or scratchy – call us at Jim’s Antennas and we’ll help you with all your antenna installation needs. Our team of installation experts specialise in all types of aerial installation tasks. Your local technician will fit the correct Antenna for the type of TV reception available in your local area. Line of sight to your nearest transmission tower is an important factor in choosing how and were the antenna is located on your roof as it often happens that if your located further away or obstructed from the nearest TV transmitter, reception problems crop up. We will first test the signal strength at your roof and then install the antenna in the most suitable position – so that you can enjoy your favourite TV shows without any reception problems. 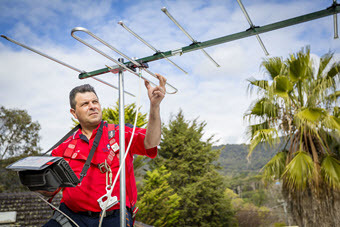 Jim’s Antennas will also ensure that the antenna functions properly even if there’s a heavy rain or storms – so that you are not devoid of crystal clear reception at any point of time. We’re also part of the trusted Jim’s Group network, which means we have access to the best products, information and pricing so you can rest assured that you’ll get great advice and value-for-money plus we’re fully insured and police checked to work on your premises. If you bought an antenna but are having second thoughts about installing it, just give us a call on 131 546– we handle TV aerial installations everyday and we’ll make sure all your cabling is correctly installed and ready for prime time TV viewing. We can also install new televisions for your safety and convenience, including putting up brackets, tuning your stations and hiding messy cables. If you think you love television, we guarantee we love it more; so call us if you have any installation requirements and you’ll be back to enjoying your shows again in no time.